Every year, right as the heat subsides but before the leaves change, comes a landmark occasion for music lovers in Kansas. If your grass is blue, then the Walnut Valley Festival is the place for you. Although the event, now in its 43rd year, has become famous for its folk and bluegrass varieties, you&apos;ll also hear the sounds of gospel, jazz and even a little bit country floating around in the air. Walnut Valley has been consistently playing host to legendary acts such as John McCutcheon and local man-about-town Barry “Bones” Patton. Last year Patton even exchanged vows onstage with the love of his life, a very fitting affair for the popular performer and local celebrity. Top musicians from around the world attend to compete in the 8 different International and National acoustic instrument championship contests. Handcrafted instruments, such as dulcimers and one-of-a-kind guitars, are awarded to the top competitors in every category. The experience becomes a sentimental one for most of the campers, and eventually becomes a staple in their yearly routine. According to Flottman, some people who attend the festival don’t even visit the live stages. 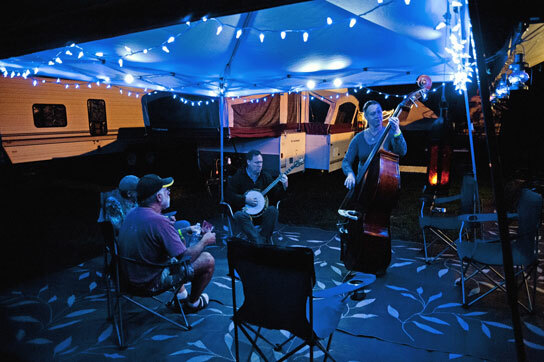 “They come for the fellowship and the musicians and the campgrounds." You can see what that fellowship is all about every third weekend of September in Winfield.